Lorene Stunson Hill is the author of 'To Dance with Ugly People' which depicts the life of an African-American from infant to childhood, teenager to adult. “To Dance with Ugly People," tells the harrowing story of Dani Ransom's travels down several dark paths. She experiences the ravages of drug abuse, suffers psychological cruelty, and the fanatical abusive love of her husband Dane. Experience Dani Ransom “Living on the Edge,” understand the narcissist hold of Dane on Dani. Witness the chaos of Dani Ransom’s mind. Troubled by man versus women, she makes many wrong decisions. Exhausted by the collapse of every aspect of her life, can she save herself and overcome the shadows of darkness that follows her? Divorced, she finally finds the love of her life, her greatest muse, an older man, Chance Wiley, but even when she strives to travel the right path, fate steps in. Haunted by her own personal ghosts she can't live life to its fullest. Is fate everywhere we are, involved in everything we do and not just the end result? What do you think? Introducing author Lorene Stunson Hill. The Author in the Spotlight today is Lorene Stunson Hill. Lorene Stunson Hill was born in St. Louis, and later raised in Detroit, Michigan. In a visit to Sardis, Mississippi (hometown of her ancestors), in her teens, Lorene experienced the cruelty of racial discrimination, but she stayed steadfast in her unshakable faith and belief in the values of the traditional African-American family, community, and culture. She currently resides in the Central Florida area. Her life was not as she would have wished it to be; one of ease and luxury. In fact, the opposite was true. She wished to make it more than it was and to tell her impressions in a story, warts and all, to help others and help bring forth something good out of misery. “Family experiences are universal,” she said. Lorene drew from the wealth of experiences placed in her path to create, "To Dance with Ugly People.” Along that path she completed Creative Writing Courses at the University of Central Florida under the esteemed guidance of Professor Wyatt, Wyatt, who taught her that, if you want to write you cannot be a coward. Lorene was never a coward. Lorene joins us to talk about her new release 'To Dance with Ugly People' which is currently on the Kindle Countdown Deal. Kindle edition is currently 99 cents (99p in the UK) starting 13th July for one week. Don't miss getting your copy at a great price. Welcome Lorene and thank you for joining us today. 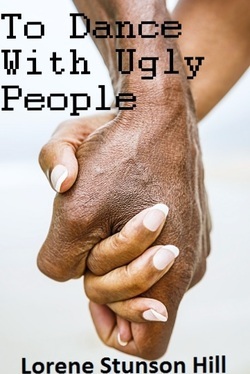 What inspired the title of -To Dance with Ugly People? In my 20’s I met an older lady who was a Financial Planner. I went to see her striving for a better financial future. After every session, as I was leaving, she would say, “Don’t Dance with Ugly People!” I’d answer, “Yes, ma’am.” But, that statement resonated with a roar in my heart. From then on, every time I had a bad experience, I would mumble (in my mind), “I just danced with Ugly People.” Of course, when I thought about seriously writing a book, “To Dance with Ugly People,” was born! What a great story Lorene, thanks for sharing that. Who is your target audience for this book? My General Target Audience is composed of people who loved Alice Walker’s novel THE COLOR PURPLE because my book is intended for a mature audience that can deal with the pain... and I advise they don’t forget their box of tissues. My Indie Publisher states, “Lorene Stunson Hill, eloquently guides you through this journey of life, hope and despair.“ My Specific Target Audience is women readers in a particular age group (young adults who are twenty-somethings, thirty-somethings and a cross section of middle-aged female readers), any woman who enjoys an Angsty Romance. It is relevant to include African-Americans, Avid Book Readers and anyone open to a book where the good is sensitively written, the bad is portrayed as the reality of life and the ugly are the things in life we hope will never happen to us – That includes male readers willing to step outside of their usual reading norm. My male publisher wrote, “Whilst not my usual genre. If you read only one book this year – make sure its this one!” My book was written for all humankind no matter what race, gender or color – showing the elementary principles of human nature that can be outside our perception as the norm. The skeleton, general idea, outline and frame work – I took details from my life to evoke a place and the people who inhabit my novel. The entire story in a nutshell. Those life details served to illuminate and liberate my imagination. I think you can only write what you know if you want to create a strong compelling novel that grabs people. Some people argue that point of view stating “You don’t have to kill several people to write about a serial killer.” Somehow, how I agree with both of those statements. Stories aren’t about people and things. Stories are things. Writers travel, move to new places, try various life experiences all in search of real life experiences that they can use to liberate their imagination. I couldn’t write a query letter that grabbed a Literary Agents eye. I got tired of being rejected. I gave up and the book sat on a shelf for 6 years. I began to see more and more on the Internet about self publishing and this year, 2014, blew the dust off the manuscript and gave it a try. "You've caused me to spend a lot of time thinking about you, Dani. Perhaps I was afraid of you. Where were you when I was nineteen and looking for a wife?" I thought for a minute and answered, "In kindergarten. "He let out a loud, chest heaving laugh. In the middle of the night when the house is quiet and everyone asleep. Sometimes I got to bed with a question on my mind, and the answer pops into my head. I jump up and write it down. I am retired, so able to take cat naps during the day. Having a new release, I don’t have time to read a novel. I am spending every minute of my spare time reading online books and articles on Marketing Strategies hoping to get my book out in front of the public. No one person. I have loved the written word my whole life. I have attended lectures and readings by Maya Angelou, Nikki Giovanni, and Sonia Sanchez. I’d shed tears of admiration sitting in the Audience. Ntozake Shange, Alice Walker, Terry McMillan and Alice Walker are among others I have admired. I had decided I would not become an Author, fortunate for the Universe, I changed my mind. Thank you for taking part Lorene and I would like to wish you every success with your new release.